Miscanthus 'Morning Light' Maiden Grass is one of the newer Miscanthus ornamental grasses. The Morning Light maiden grass displays a fine textured dense clumping grass that glows in the morning sunlight. Variegated Morning Light is named because of the thin white band along the margins of the leaves that shines in the morning sun. 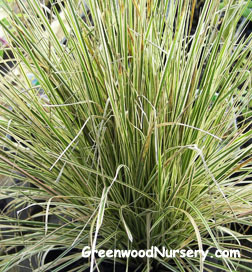 The foliage of this maiden grass slender leaves gracefully arch and spread to give the illusion of a glowing fountain. This tall ornamental grass grows 5 to 6 feet tall clumps burst with a display of pink flowers that hold above the foliage from late summer through fall which can be used for dried flower arrangements. With flexible yet sturdy foliage that blows easily in the wind, the Morning Light Miscanthus sinensis Grass is a shrub like grass turns to a rich golden hue in the fall and persists through the winter.